Hawaii is the newest of the 50 states of the United States and the only U.S. state that is entirely an island archipelago. It's located in the central Pacific Ocean to the southwest of the continental U.S., southeast of Japan and northeast of Australia. It is made up of over 100 islands, however, there are eight main islands that make up the Hawaiian Islands and only seven are inhabited. People watching lava flow into the ocean. The island of Hawaii, also known as the Big Island, is the largest of Hawaii's main islands with a total area of 4,028 square miles (10,432 sq km). It is also the largest island in the United States and like the other islands of Hawaii, was formed by a hotspot in the Earth's crust. It is the most recently formed of Hawaii's islands and as such it is the only one that is still volcanically active. The Big Island is home to three active volcanoes and Kilauea is one of the most active volcanoes in the world. The highest point on the Big Island is the dormant volcano, Mauna Kea at 13,796 feet (4,205 m). The Big Island as a total population of 148,677 (as of 2000) and its largest cities are Hilo and Kailua-Kona (normally called Kona). Maui is the second largest of Hawaii's main islands with a total area of 727 square miles (1,883.5 sq km). It has a population of 117,644 people (as of 2000) and its largest town is Wailuku. Maui's nickname is the Valley Isle and its topography reflects its name. There are lowlands along its coasts with several mountain ranges that are separated by valleys. The highest point on Maui is Haleakala at 10,023 feet (3,055 m). Maui is known for its beaches and natural environment. Maui's economy is based mainly on agriculture and tourism and its main agricultural products are coffee, macadamia nuts, flowers, sugar, papaya, and pineapple. Wailuku is the largest city on Maui but other towns include Kihei, Lahaina, Paia, Kula, and Hana. Diamond Head and Waikiki Beach. Oahu is the third largest island of Hawaii and with a total area of 597 square miles (1,545 sq km). It is called the Gathering Place because it is the largest of the islands by population and it is the center of Hawaii's government and economy. Oahu's population 953,307 people (2010 estimate). The largest city on Oahu is Honolulu which is also the capital of the state of Hawaii. Oahu is also the home of the largest U.S. Navy fleet in the Pacific at Pearl Harbor. Oahu's topography consists of two main mountain ranges that are separated by a valley as well as coastal plains that ring the island. Oahu's beaches and shops make it one of Hawaii's most visited islands. Some of Oahu's top attractions are Pearl Harbor, the North Shore, and Waikiki. Kilauea mountains on the north coast of Kauai. Kauai is the fourth largest of Hawaii's main islands and it has a total area of 562 square miles (1,430 sq km). It is the oldest of the main islands as it is located the farthest away from the hotspot that formed the islands. As such its mountains are more highly eroded and its highest point is Kawaikini at 5,243 feet (1,598 m). Kauai's mountain ranges are rugged however and the island is known for its steep cliffs and rugged coastline. Kauai is known as the Garden Isle for its undeveloped land and forests. It is also home to the Waimea Canyon and Na Pali Coast state parks. Tourism is the main industry on Kauai and it is located 105 miles (170 km) northwest of Oahu. Kauai's population is 65,689 (as of 2008). Halawa Valley and Hipuapua Falls. Molokai has a total area of 260 square miles (637 sq km) and it is located 25 miles (40 km) east of Oahu across the Kaiwi Channel and north of the island of Lanai. Most of Molokai is also a part of Maui County and it has a population of 7,404 people (as of 2000). Molokai's topography consists of two distinct volcanic ranges. They are known as East Molokai and West Molokai and the highest point on the island, Kamakou at 4,961 feet (1,512 m) is a part of East Molokai. These mountains, however, are extinct volcanoes that have since collapsed. Their remains give Molokai some of the highest cliffs in the world. In addition, Molokai is known for its coral reefs and its south shore has the world's longest fringing reef. Manele Golf Course on Lanai. 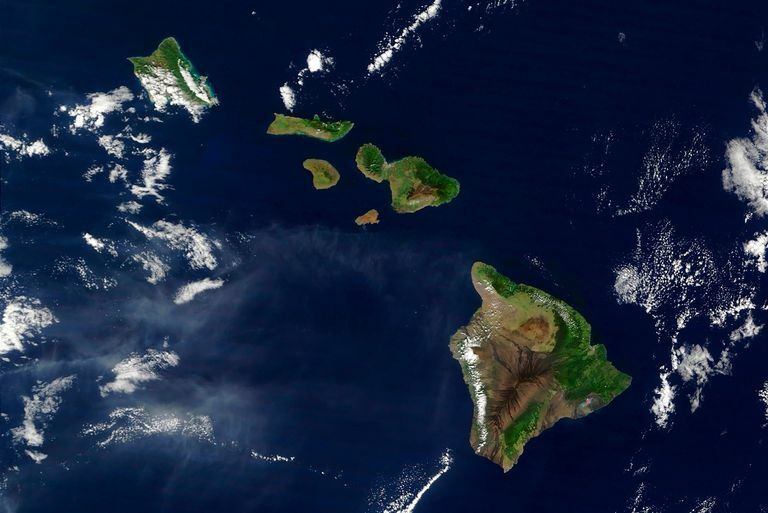 Lanai is the sixth largest of the main Hawaiian Islands with a total area of 140 square miles (364 sq km). The only town on the island is Lanai City and the island has a population of only 3,193 (2000 estimate). Lanai is known as the Pineapple Island because in the past the island was covered by a pineapple plantation. Today Lanai is mainly undeveloped and much of its roadways are unpaved. There are two resort hotels and two famous golf courses on the island and as a result, tourism is a large part of its economy. Niihau is one of the lesser known Hawaiian islands and it is the smallest of the inhabited islands with an area of just 69.5 square miles (180 sq km). The island has a total population of 130 (as of 2009), most all of whom are Native Hawaiians. Niihau is an arid island because it is in the rainshadow of Kauai but there are several intermittent lakes on the island that have provided wetland habitat for a number of endangered plants and animals. As a result, Niihau is home to seabird sanctuaries. Niihau is also known for its tall, rugged cliffs and the majority of its economy is based on a Navy installation which is located on the cliffs. Aside from the military installations, Niihau is undeveloped and tourism is non-existent on the island. Kahoolawe is the smallest of Hawaii's main islands with an area of 44 square miles (115 sq km). It is uninhabited and is located 7 miles (11.2 km) southwest of Maui and Lanai and its highest point is Pu'u Moaulanui at 1,483 feet (452 m). Like Niihau, Kahoolawe is arid. It is located in the rainshadow of Haleakala on Maui. Because of its dry landscape, there have been few human settlements on Kahoolawe and historically it was used by U.S. military as a training ground and bombing range. In 1993, the State of Hawaii established the Kahoolawe Island Reserve. As a reserve, the island can only be used today for Native Hawaiian cultural purposes and any commercial development is prohibited.